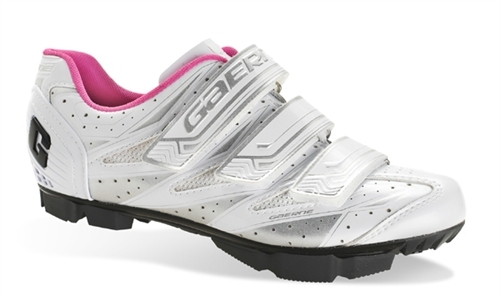 Gaerne G.Venere Cycling Shoes for Women. • Fit: All-new woman's fit and secure 3 strap entry system. Rigorously studied to consider the unique anatomy of the woman's foot. Particular attention is reserved for the more delicate metatarsal area and heel. • Upper: single piece of microfiber minimizes the amount of stitching for improved comfort. Perforations maximize foot aeration. Internal mesh inlay increases foot stability and support. • Tongue: The shoe's tongue is perforated for better internal airflow and features a high-tech cushioning layer for increased comfort. • Heel Cup: All-new injection moulded plastic anatomic heel-cup will not deform or weaken. Anti-tendonitis form with internal non-slip treatment for the best foot stability and control. Reflective inserts provide maximum visibility in low-light conditions. • Insole: A special anatomic design actively stimulates the cyclist's foot with each pedal stroke to improve athletic performance. Hypoallergenic and anti-bacterial. Thanks to a series of micro-perforations, optimal foot ventilation is provided. Insole is removable. • Sole: “Gaerne Mtb Sole Technology”.